What is the difference between opening and closing gap sensors? In many pressure sensing applications, high accuracy is a must-have. Whether you’re working with thousands of PSI or only a quarter inch of water column, the most demanding jobs require the best tools available. While there are many types of pressure sensing devices on the market, none quite match variable capacitance transducers in terms of accuracy and quality. Variable capacitance pressure transducers are generally more accurate than other types of pressure sensors, with some products demonstrating accuracies as high as ±0.05% FS. 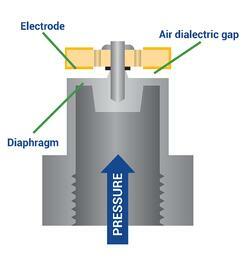 Simply put, these kind of pressure transducers are a type of capacitor, a device with the ability to hold a charge. When pressure is applied to a diaphragm inside the sensor, the diaphragm flexes away or towards a fixed electrode and changes the capacitance of the device. This physical change results in the change of an electrical output, allowing the device to convert a pressure reading into a current or voltage value. 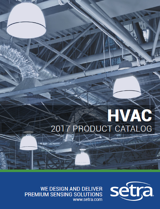 However, while the principle may be the same, a sensor used in a low-range room pressure monitor is very different than one used in a high-range engine test stand. 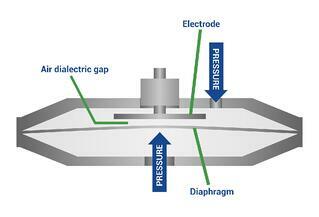 There are two types of variable capacitance sensors in use today: closing gap and opening gap. In a closing gap sensor, there is a stretched membrane made of very thin stainless steel that moves towards or away from a fixed electrode, changing the capacitance value. A closing gap capacitive sensor is typically used for measuring low pressure applications with ranges less than 15 PSI. Typical applications for this kind of sensor would be room pressure monitoring and HVAC applications. Closing gap sensors can either be unidirectional or bidirectional, depending on the needs of the application. In a unidirectional transducer, the sensor linearizes the output as the diaphragm flexes towards the electrode, whereas the diaphragm in a bidirectional sensor can move in either direction as the pressure changes. Opening gap sensors work in the opposite way; the diaphragm moves away from the electrode when pressure is applied, causing the change in capacitance and therefore a change in electrical output. These sensors are typically used industrial, OEM, and test & measurement applications that are used in systems that experience pressures ranging from 15 PSI up to 10,000 PSI. Regardless of whether a sensor is opening gap or closing gap, either can be made from a variety of stainless steel. Oftentimes, industrial pressure transducers are used in conjunction with hazardous and corrosive materials. Hydrogen, for example, is corrosive to certain kinds of stainless steel (such as 17-4 SS) and can cause components to fail after long enough exposure. Because of this, some sensors are being designed with corrosion-resistant wetted materials, such as diaphragms made of 316 L stainless steel.